Star Wars: The Force Awakens has been in theaters for 50 days. And new Easter eggs are still being discovered. Today's big reveal is actually pretty cool. Especially since it's tied into Indiana Jones. And it comes at a crucial point in the movie involving Han Solo and Chewbacca. It literally ties Harrison Ford's two iconic characters together in one fail swoop. You just need to know what to 'listen' for. Director J.J. Abrams has decided to cram so many hidden nods and references in The Force Awakens, that it has become a virtual game for some. And it's a game that requires multiple viewings. Some of the Easter Eggs are so well hidden, though, that they are likely to fly right over your head. Luckily, those involved with the behind-the-scenes work on the film have been eager to share some of their more obscure references. And the Raiders of the Lost Ark nod is definitely one that is bound to be missed. That's especially true since this Easter egg is obscured by the sounds of a screaming Rathtar. Star Wars: The Force Awakens sound designer David Acord confirmed to Nerdist that when we see Han Solo and Chewbacca running to get away from the rolling Rathtar, he added in the same sound effect that accompanies the boulder that chases Indiana Jones during the opening action scene in Raiders of the Lost Ark. He states the following. 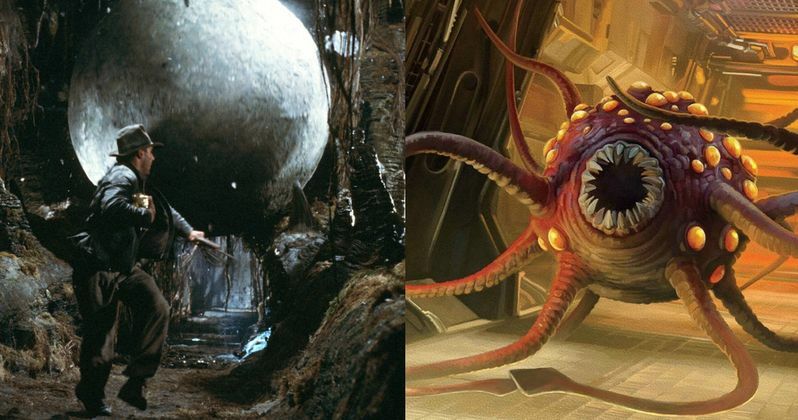 "There's some cool things like when the rathtar is rolling down the hallway after Han and Chewie, I put in the sound of Ben Burtt's boulder roll sound from Raiders of the Lost Ark when the boulder is chasing Indy." Star Wars: The Force Awakens was mixed at Skywalker Sound, allowing David Acord and supervising sound editor Matthew Wood access to the full LucasFilm sound library. The pair used quite a few iconic Star Wars sounds in the movie. And they found some from other movies as well. The movie has since been nominated for a best sound editing Oscar. One of the more unique Kylo Ren sounds actually came from David Acord's cat. He also explains how he achieved the sound of the Rathtar stuck to the Millennium Falcon cockpit. "The Kylo Ren Force rumble-the really chunky and animalistic rumble-is my cat's purring. It's heavily pitched and slowed version of my cat's purr that becomes Kylo Force rumble. When the rathtar has his mouth on the cockpit of the Falcon, when it's trying to eat the cockpit, that is me literally choking myself. [Laughs] Finger down my throat in front of the mic to accomplish that and then it's pitched down." Now you know what to listen for the next time you Star Wars: The Force Awakens. The movie is set to hit Blu-ray and DVD this April. We're sure plenty of fans will be scouring through the movie frame by frame on an obsessive level. So prepare for even more Easter Egg reveals in the near future. As for now, it's pretty cool that Han and Indy have this link, right? Sound off in the comments below.